Mary Ann Drummond, RN, has more than 30 years of nursing experience and is the author of “Meet Me Where I Am: An Alzheimer’s Care Guide. She has spent much of her career as an executive working in the assisted living industry and dedicates much of her time to sharing educational concepts regarding Alzheimer’s care at care giver symposiums and various community health presentations. 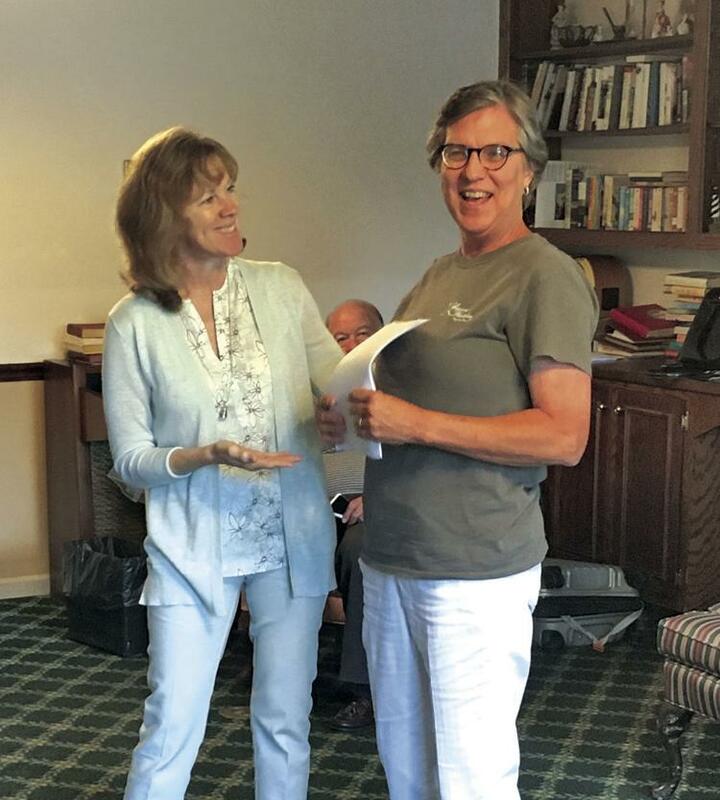 Drummond, pictured left, conducts a role play demonstration as part of a training session she led for caregivers June 12-13 at Longwood Plantation in Orangeburg. The caregivers of individuals living with Alzheimer’s disease at an Orangeburg assisted living community were recently given tips by an author and speaker on how to enhance their service and help those they serve live their best daily. Mary Ann Drummond, RN, who has more than 30 years of nursing experience and has spent much of her career as an executive working in the assisted living industry, conducted Alzheimer’s training sessions at Longwood Plantation June 12-13. Having been responsible for Alzheimer’s programming design and implementation at multiple special care units throughout North Carolina, Drummond now dedicates much of her time to sharing educational concepts about Alzheimer’s care at caregiver symposiums and community health presentations. The training at Longwood Plantation included role play, which provided real-life scenarios encountered in Alzheimer’s care, along with solutions to difficult situations. “With persons living with dementia, oftentimes we find that there are still capabilities left that are able to be unlocked when we do a little deeper dive. And I think that’s what the outcome will be,” she added. The first of five steps to “Meet Me Where I Am” care is to practice the ABCs (Anticipate, Believe Create), Drummond said. “We want to anticipate the care environment, making sure that it’s safe and set up for success. We want to believe in the ability of the person versus the disability … . With the right stimulation, the right program, the right care approach, the ability is still there” if opportunities for success are created, she said. Drummond said the second step is knowing the three questions to ask to determine if an intervention is needed. Is the person hurting themselves? Are they hurting anyone else? Are they exhibiting normal behavior? “Sometimes we want to correct everything,” but it may not be necessary, she said. Understanding how to achieve “R&R” for Alzheimer’s patients is the third step listed by Drummond. Drummond touted remembering to include auditory, visual and tactile stimulation when presenting information as the fourth step in the care of those with Alzheimer’s. “Many times they can no longer find words. When we present information in all three ways, because the brain cells are injured, the chance of the information getting through in a way that the brain processes goes up,” she said. The fifth step is to develop a unique place of person-centered care made to embrace individual interests, hobbies and life stories, she said. “We’ve been the only free-standing dementia care community for the last 18 years in Orangeburg, and we want to continue to press forward as new ideas and thoughts come about in giving the best care we can to this very fragile population,” he said.